If you are new to generational research, you should start here. Trump and the Generations Part 3: When Did the Fourth Turning Start? Millennials as Leaders? What About as Followers? JessieX on Trump and the Generations Part 3: When Did the Fourth Turning Start? Mariam on Trump and the Generations Part 3: When Did the Fourth Turning Start? Is the Millennial Generation a bunch of Cylons? Battlestar Galactica is a modern myth, in the vein of the original Star Wars. Each generation is represented in the series, including the Millennials. Spoiler alert: If you have not watched any of Battlestar Galactica, or have only watched the first season, there are plot spoilers to follow. I was watching the first few episodes of Season 2 of Battlestar Galactica last night and got to the point where they find the “map” to Earth in the form of the 12 zodiacal constellations. Until that point I had been seeing the story as a myth that portrayed the Cylons as the believers in the “One True God” (e.g. Christians) vs. the humans who believe in a multi-pantheon (e.g. New Age Spiritualists). Others have said that the humans represent the United States and the Cylons represent modern terrorists. But last night I realized it might be a more subconscious modern myth that symbolizes the current living generations. Science fiction has a history of taking on social concepts, from Star Trek with it’s strong social themes to Star Wars which was profiled by Bill Moyers and Joseph Campbell as the modern telling of the Hero’s Journey. Thinking in those terms, of the mythical meaning of the Battlestar Galactica, (which is produced and directed by Boomers and X’ers), I couldn’t help but wonder if the battle going on right now between the generations is represented in the story. Let’s look at the current living generations and then compare with some of the characters. Silent Generation: Born 1925-1942. This group is starting to fade from prominence right now, but they had a reputation as being an expert, if overly conservative generation. Boomer Generation: Born 1943-1960. Moving into elder leadership now, this generation represents the “Prophets” who have a strong vision of the future and will argue their opinions to the death. Generation X: Born 1961-1981. Moving into midlife right now, this generation is practical and pragmatic, but often cynical. They are individualistic and do not particularly care for large institutions or dogmatic leadership. Millennial Generation: Born 1982-200?. Moving into young adulthood now, this generation is optimistic, empowered, team-oriented and at times a bit arrogant about what they will accomplish. For those of you that are fans, can you see the connection between the various characters now? The Silents are not well represented, but the other groups are definitely in there. 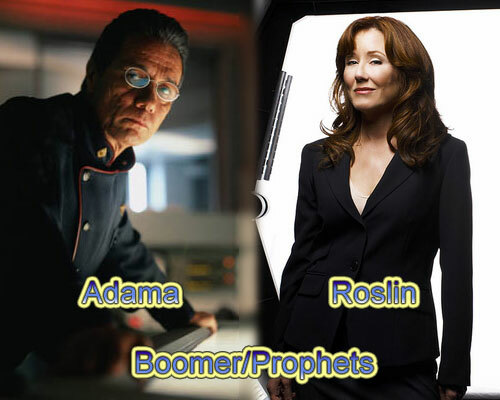 For example, Bill Adama, commander of the Battlestar and President Laura Roslin are both of the elder generation, similar to the Boomers. They are highly opinionated and have their unshakable vision in what needs to be done. The President literally believes that she is a prophet, destined to take the human race to a new and better future. Adama is driven by a desire for honor and order as prescribed by his military background. Both are willing to attack each other to defend their view and control of the future. That, in a nutshell, is the attitude of the Boomer/Prophet generation. Strong opinions, a visionary view and and a righteousness in the face of adversity. The Commanders’s son, Lee Adama, whose call sign is Apollo, as well as Starbuck (and many more of the crew) are all much more pragmatic in their approach. Although they will take sides if forced to, they judge everything by it’s practical implications. 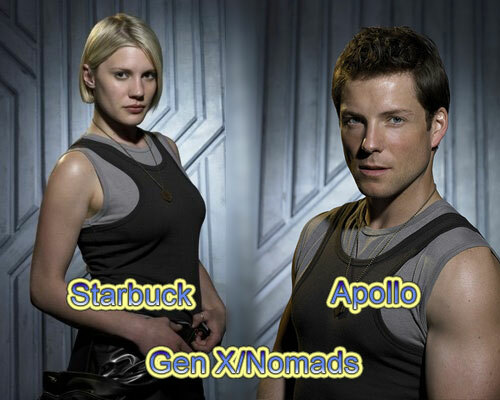 Starbuck is a loner, alienated from most of those around her. Even though Apollo is the golden boy son (hence his call sign) of the Captain, he refuses to believe in the Commander’s ideals. This is very much in character with Generation X, a generation that is practical, pragmatic and don’t really care about ideology or following rules. They are the nomad generation. So that leaves the Millennials. They are represented by the evil Cyclons. The Cylons believe in “One True God”, one perfect ideal that they must create. They are literally “of one mind”, having a serious case of group think. There are only a few models of Cylon, and that means that they mostly think alike. They work together flawlessly as a team and are moving towards creating a world based on their singular vision. They are optimistic (perhaps overly so) about their future and see their success as pre-ordained. This represents the stereotype of the Millennial generation quite well. Millennials are generally seen as having a strong civic nature, a desire to rebuild society based on their ideals. They also work together very well and tend to be optimistic and at times arrogant about the likelihood of their success. They are the “Hero” generation, but clearly not portrayed in that light in the series. The interesting thing to note if you buy that characterization is that the Cylons are considered EVIL and are out to destroy the entire human race! What does that say about the Millennials? It actually says a lot more about the Gen X/Boomer bunch that created Battlestar Galactica than it does about the Millennials. Although even by the start of season two there are some humans who are starting to sympathize with the Cylons, they are still very much considered the enemy. The same can be said for the attitude of many Gen X’ers and Boomers towards Millennials. There are a few of the older generations that believe in the positive qualities of the Millennials, but most are pretty put off by what they believe is a sense of entitlement and brazenness. Books like “Dumbest Generation” and “Generation Me” point towards a belief that “kids today ain’t no damned good”. The other parallel is the idea of the Cylons being machines that look like humans. The Millennial generation is also categorized as being the “digital” generation, networked to each other through their devices and constantly in communication with each other. I think that Battlestar Galactica is a good example of the sort of modern myth that Cambpell and Moyers identified years ago in Star Wars. The first Star Wars series was really about the path of the Boomers (think Luke Skywalker) overthrowing the GI Generation (think Darth and the empire). Like all myths it was probably not consciously made with this connection to the current social forces, but they were embedded in subconsciously. Should we trust the Cylon/Millennials? Like the characters in Battlestar Galactica we probably don’t have much choice in the matter. And unlike the Cylons, the Millennials ARE going to take over the world eventually (unless Boomers and X’ers figure out a way to magically extend their lives). So perhaps it is time to figure out how we can work together to build something better. Boomers and X’ers control pop culture right now and trying to feed a message to society based on their values. The Millennials have a different take and that makes those in control uncomfortable. But make no mistake, Boomers and X’ers, the Millennials will win this battle (eventually) and treating them like they are babies, less than, or unimportant will not help matters. I haven’t seen this comparison anywhere else on the Internets. There is a book on the philosophy of BSG. There are also several analysis of the cylons as an analogy for modern terrorists, here, here and here. I would love to hear people’s comments on the concept, but I have one request: don’t spoil the rest of the series for me by giving away plot lines beyond the first few episodes of the second season. Also, any of you generation types out there have a guess as to who represents the Silents in the series? Posted on March 9, 2009 March 9, 2009 Categories Generations, MediaTags adama, Archetypes, battlestar, battlestar galactica, boomers, bsg, cylons, galactica, gen y, gen-x, generation, generation X, generation y, Generations, genX, joseph campbell, millenials, myth, pop culture, silen, x15 Comments on Is the Millennial Generation a bunch of Cylons?